75% OFF! Get 8 products including 6 wreath creators, 308 individual PNG, 39 patterns for $19! 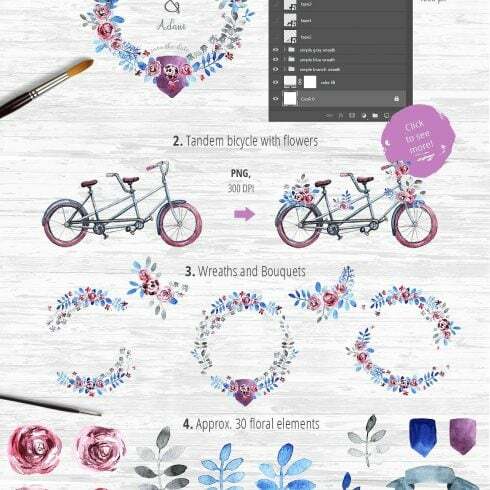 Wreath Creator is a great tool to create a special design in a single style. Besides, it’s fun and interesting. Find the combinations that you like! Adobe Photoshop and Adobe Illustrator CS6 or newer are required! BUT if you don’t have them, all zip files include each layer in PNG for designing in your favorite editing software! Also a basic knowledge of layers is required. Turn on and off layers to find a nice view! 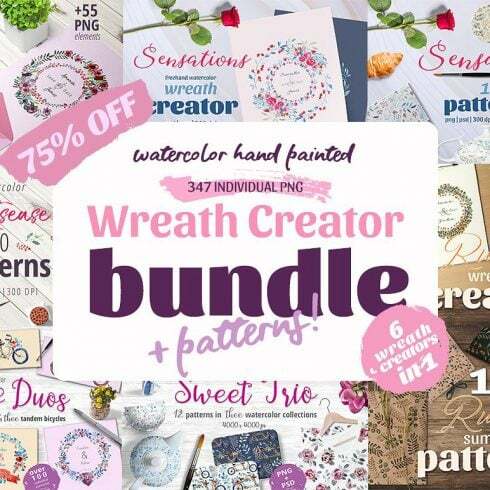 Exactly what is a Wreath Creator Bundle Mega Bundle deal? Just about every artist, being a skilled professional, surely should be able to draw anything from a blank canvas. It truly is unproductive, takes too much time. That is why most of the designers work with pre-made graphics elements – mix these graphic components, adjust them and construct the design . Noone is going to buy all those components separately, so that is why they are put together into graphic deals and offered for sale as a single product. Any ways to make Wreath Creator Bundle Mega Bundle even more cost-effective? You can make the MasterBundles.com items even cheaper. Yeah, I know they are already cost-effective, there is however still place for saving. Just share this webpage in social websites – you immediately get the 5% price reduction for the graphic bundles you like. That’s a very easy way to get a professionally created tools for a lower price. Given that each of the bundle deals are different from one to another, each individual web designer will discover the needed selection for a unique venture. Exploring them you will uncover the selections including illustration swatches, business cards, social media infographics, UI kits, and much more. At MasterBundles marketplace, you’ll find over 450 graphic packages to pick from. That being said, you’re not going to have a chance to leave the website empty-handed. The pros of graphic deals for graphic designers are usually quite evident. But if you are new to those elements and still have concerns, the following information and facts will be helpful for you. Including a large number of the elements in a single bundle, the collection provides you with an opportunity to use different of them for various tasks. Besides, the price is usually greatly reduced which lets you save some money, yet receive the complete set priced at hundreds or thousands of dollars. Besides graphic design bundles, you’ll find a massive number of various other deals on MB. The bundle deals of stock photos, logo templates, patterns, fonts and textures are available . Furthermore, you’ll find the entire packages of WordPress themes, courses and ebooks, resume templates, slides, and other components. In the online and digital age, many of us devote virtually one half of our everyday life within social networks like Instagram. No matter what purpose we strive to achieve by using this network, we wish to be noticeable in a crowd amidst countless similar accounts. With premium Instagram design templates sold at MasterBundles.com, you don’t have to devote eternity developing the outstanding look of your Instagram page. The watercolor package is found to be the lovliest innovation in design. Painted by painters on the paper, the images become scanned and included in a package as design templates for projects. Watercolor components are perfect for wedding invitations, greeting cards, blogs, DIY and quotes. All of the pictures are exceptionally detailed and prepared for printing or use in a digital way. If you feel as if you have lost track of time when researching various tools and components for your own design jobs, it is high time to explore MasterBundles. This is a marketplace providing the most widely used instruments (fonts, icons, logos, graphics, watercolors, presentations etc.) for graphic designers, online marketers, and developers at an affordable price for a short period of time. In order to not miss out on major updates regarding the upcoming promos, we advise reading our blog and subscribing to the newsletter. How not to miss a single sales offer on MasterBundles and save up to $ 1,420 on one purchase?